The Analog Expansion Boards (AEB) transforms RME's digital cards, the DIGI96 and Hammerfall series, into the most flexible audiocard series available. The AEBs 8 analog outputs are a cost-efficient addition for all ADAT-capable cards of the DIGI96 and Hammerfall series. Best of all: pure RME quality, i.e. 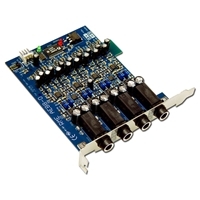 107 dBA Signal to Noise ratio, level adjustment +4/-10 dBu and servo balanced inputs and outputs (AEB4). Combine the reliability, outstanding performance and unsurpassed compatibility of drivers and hardware of the DIGI96 series with analog I/Os! Simply connect the AEB and the card using the supplied cables, set clock mode to Master, input to internal and go!